"The Second Death of Superman"
"Future Tense: Tales of the Legion of Super-Heroes"
Lightning Man, Saturn Woman, Cosmic Man and several other members of the Legion of Super-Heroes break into a secure facility and steal a time bubble. The cost is great but the founding Legionnaires are successful in liberating the bubble and escaping to the past. Lois and Jimmy arrive at the Superman memorial statue to meet Clark Kent. They discuss the day Superman died before the Man of Steel crashes into the ground. He tells Lois and Jimmy to get to Metropolis General and find Mr. Triple X before it's too late. Suddenly Xa-Du lands behind him and the two start fighting. Suddenly Susie, Lois' niece, attacks Superman mentally but Lois is able to talk her out of helping the little man Susie made the deal with. The fight continues until Vyndktvx appears and uses his magic to contact every person on the planet and offer a deal; he will give them life eternal in his forever kingdom as long as when Superman comes begging for help they say no. Krypto arrives just in time to stop the Anti-Superman army from killing Superman's spirit. He causes them to scatter and gets his master to safety. Meanwhile Jimmy and Lois finally get to Metropolis General. The villains go to Vyndktvx for help when suddenly Krypto arrives and attacks the fifth dimensional devil. Back at Metropolis General Lois and Jimmy prevent Mister Triple X from being killed by an assassin and then wonder why Superman wanted them to come to Triple X's side. Luthor and Vyndktvx stand before a machine that will serve as the ultimate anti-Superman weapon. An armored creature steps out of the machine, which came to Luthor in a dream, and Lex demands that it be shut down. Vyndktvx tells him that it is much too late for that and adds that today is Super-Doomsday. 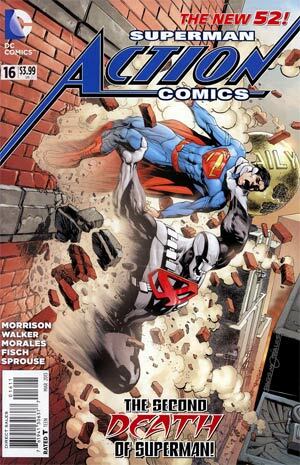 The Legion materializes in Triple X's room and offers assistance as Super Doomsday asks Superman if he is ready to die. Superman tells him that actually he thinks he has other plans. Story - 4: When I did my first read through of this issue I didn't care for it all that much. It seemed to be more of the time jumping, weird story telling that Morrison is known for. I was ready to pretty much write the whole storyline off. Then, as I did my second read through so I could type up the synopsis something kind of strange and unexpected happened. I found myself really getting into the story. Not only that I found myself liking how it was playing out, or at the very least liking aspects of what I was reading. There were some genuinely exciting moments in this story and because of that I started paying closer attention to what was going on in the story and came to a few conclusions. Conclusion #1: I still hate Morrison's storytelling or I guess I should write that I hate the more Morrisony Morrison storytelling. It's not for me. I've gone on and on about this and I think that's all I need to say about that. Conclusion #2: Despite not liking the time jumping stuff that was going on I did like how Morrison tied all of the elements of his run and of the back up stories in ACTION together. It made me feel like I hadn't been wasting my time with the book. While it is weird as all get out I feel like there was a plan all along and that was a good feeling to have. Conclusion #3: I love the idea of all of Superman's villains attacking at once at the direction of a devil from the fifth dimension. Conceptually that is awesome and the action has been pretty satisfying. Conclusion #4: The best moment in the entire issue was when Krypto arrived to help his master. Awesome doesn't even begin to describe it. Morrison built to the moment beautifully and it paid off nicely. 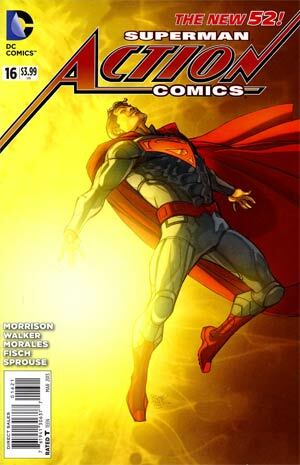 Conclusion #5: I don't like the idea that the death of Superman in the New 52 is just another story in the Man of Steel's past. I realize that I am incredibly biased when it comes to the Death and Return of Superman saga but that was not just a story, it was an event. It was an epic saga that went beyond just Superman fighting Doomsday. Morrison takes that idea and sums it up in a few lines of expositional dialogue and that bugged me. I can see where Morrison is coming from but it seemed to cheapen the whole idea. The fact that the New 52 Metropolis has a statue in Centennial Park is nice but it feels like this reality didn't earn it if that makes sense to anyone but me. Conclusion #6: Morrison is going to have to do something spectacular with Super-Doomsday to make the idea not seem silly. Conclusion #7: Mister Triple X. That name makes me laugh. Conclusion #8: I realize that this is another example of having a problem with something because I have been following Superman for the past twenty-five years but this recent constant need to insert the Legion into his stories is getting a little annoying. It was bad enough they played such a heavy part in NEW KRYPTON now I have to put up with them here. I know, I know. It's a time travel story, the Legion and Superman are linked, this all makes sense in the end. I get it. I just don't have to like it. Conclusion #9: The last page was an awesome cliffhanger. This is a Superman I can get behind. So yeah...that was so weird. Hated it on the first read, liked it on the second and now I am in this nebulous area between the two. I will admit that I am curious to see how everything plays out but I am also going to be happy when the story is over and we get to see what Andy Diggle will bring to the title. Art - 4: I loved the art in this issue. The opening scene with the Legion was great. The action popped in all the right ways. I continue to love what they have done with Krypto and the shot of the Legionnaires on the second to last page was amazing. This issue was heads and tails above the last one artistically. I could not be happier with it. The only reason it doesn't get a five is because it took two artists to complete. "Future Tense: A Tale of Legion of Super-Heroes"
In the year 3013 the Legion prevents President-Elect Takaneda from being assassinated not once but twice from a man claiming to have seen the future. This man believes that Takaneda will plunge the universe into darkness leading most of the Legion to believe the man is delusional. This idea is only strengthened when Saturn Girl reads his mind and finds out he believes exactly what is he saying. The man dies and Takaneda thanks the Legion, adding that everything that happens from then on will be thanks to them. Later, as Takaneda drives away he assumes his true form as Universo and believes that the future looks bright indeed. Story - 4: This wasn't a bad story by any stretch of the imagination. I rather liked it as a straight forward Legion story and as eight pages worth of context at the evil that the Legion was fighting at the beginning of the main story. In all honesty I didn't expect to like it because of my previously stated annoyance about how the Legion was inserted into the overall story. Sholly Fisch didn't let me down and though the whole, "Everything that happens from now on will be thanks to the Legion," thing was a tad heavy handed it worked for me. While this wasn't my favorite of the back-ups I still liked it quite a bit. Art - 4: The art served the story well. Sure Takaneda looked like Charles Bronson through most of the story but overall Sprouse and Story gave us the clean and happy artwork this era demanded. Their Universo wasn't exactly bone chilling but the transformation at the end sold what was going on well enough. Cover Art - 3: To be honest this cover doesn't do a whole lot for me. 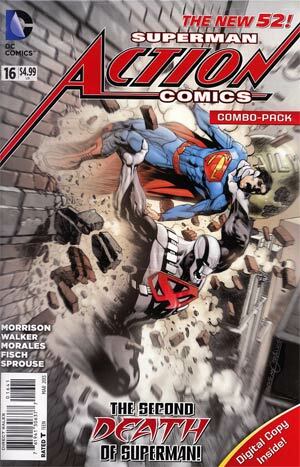 The action falls kind of flat, I am not all that impressed with Super Doomsday and Superman looks kind of wonky. This is one of those rare times when I looked at the cover and knew I wasn't going to like what I was going to read. Variant Cover Art - 4: I'm kind of torn on this one. On one hand I really like how Superman looks on the cover. On the other not a whole lot is going on. Superman seems to be getting attacked from behind by the sun. It's kind of weird but I prefer it to the main cover. 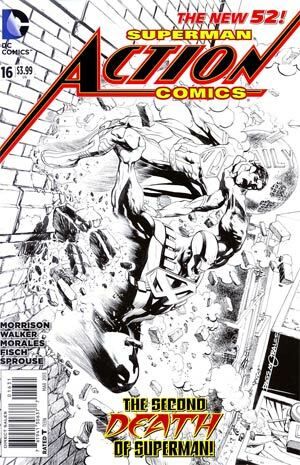 Variant Cover Art - 3 (Black and White): Usually the black and white version of the cover is an improvement over the regular one. That didn't happen here. The image still falls flat for me.